Family of scholars and rabbis of Speyer, Rhenish Bavaria, with numerous branches in other parts of Germany, and in Bohemia, Galicia, and Poland. It originally bore the name "Ashkenazi," to distinguish it from the Kahane or Katz-Spira family. Many prominent families of Bohemia added to their names that of "Spiro" or "Spira"; e.g., Frankl-Spiro, Wiener-Spiro, and Porges-Spiro. Son of Benjamin Wolf Spira (No. 7) and grandson of Jehiel Spira; rabbi of the Meisel Synagogue, Prague. Podiebrad-Foges, Alterthümer der Prager Judenstadt, pp. 76, 149, Prague, 1870. 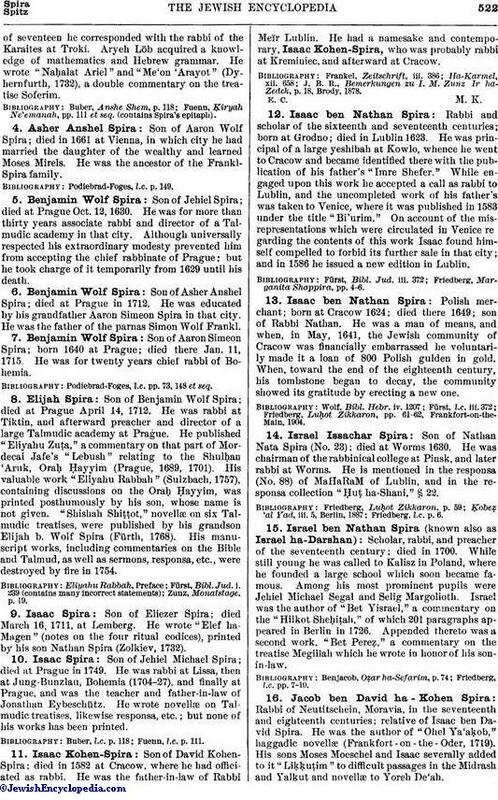 Son of Benjamin Wolf Spira (who died in 1630); rabbi at Frankfort, Lemberg, Brez in Lithuania, Lublin, Cracow, Vienna, Prague (1640), and also rabbi of Bohemia; born 1599; died Dec. 3, 1679, at Prague. He led an ascetic life, and collected many pupils about him. He wrote "Moreh Yeḥezḳiel Ḳaṭon" (Prague, 1695), penitential prayers ("seliḥot") on the sufferings of the Jewish community of Prague when that city was besieged by the Swedes in 1648. 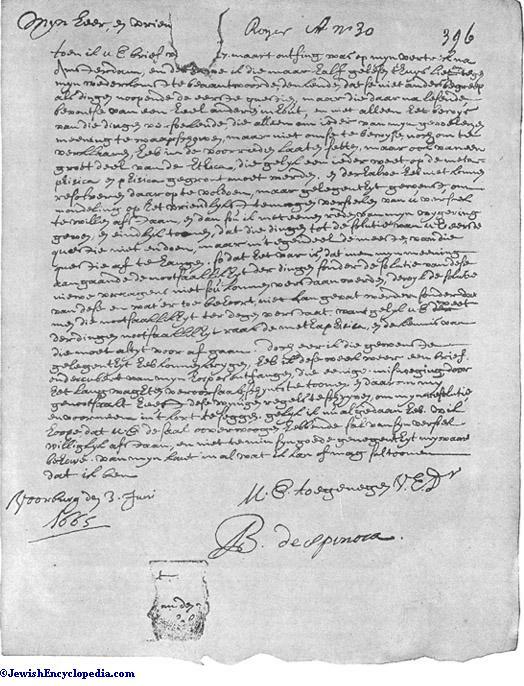 Holograph Letter of Baruch Spinoza, Dated 1665. 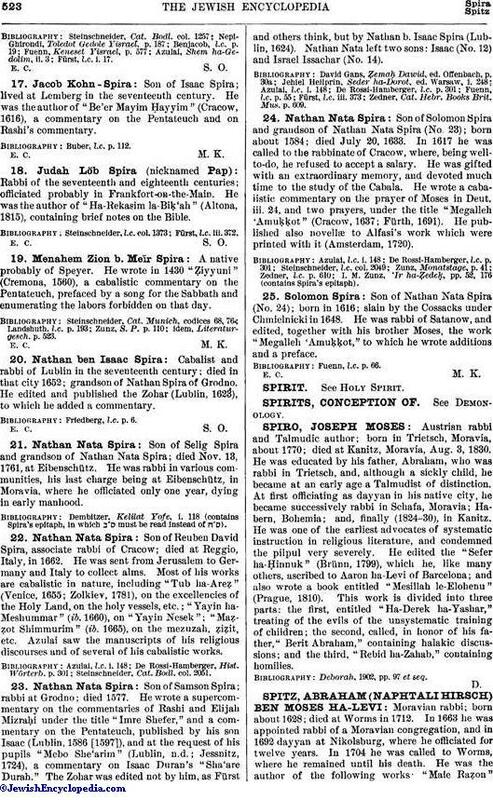 Son of Isaac Spira; born 1701; died May 19, 1761, at Wilna, where he was associate rabbi. At the age of seventeen he corresponded with the rabbi of the Karaites at Troki. Aryeh Löb acquired a knowledge of mathematics and Hebrew grammar. He wrote "Naḥalat Ariel" and "Me'on 'Arayot" (Dyhernfurth, 1732), a double commentary on the treatise Soferim. Fuenn, Ḳiryah Ne'emanah, pp. 111 et seq. (contains Spira's epitaph). Son of Aaron Wolf Spira; died in 1661 at Vienna, in which city he had married the daughter of the wealthy and learned Moses Mirels. He was the ancestor of the Frankl-Spira family. Son of Jehiel Spira; died at Prague Oct. 12, 1630. He was for more than thirty years associate rabbi and director of a Talmudic academy in that city. Although universally respected his extraordinary modesty prevented him from accepting the chief rabbinate of Prague; but he took charge of it temporarily from 1629 until his death. Son of Asher Anshel Spira; died at Prague in 1712. He was educated by his grandfather Aaron Simeon Spira, in that city. He was the father of the parnas Simon Wolf Frankl. Son of Aaron Simeon Spira; born 1640 at Prague; died there Jan. 11, 1715. He was for twenty years chief rabbi of Bohemia. Podiebrad-Foges, l.c. pp. 73, 148 et seq. Son of Benjamin Wolf Spira; died at Prague April 14, 1712. He was rabbi at Tiktin, and afterward preacher and director of a large Talmudic academy at Prague. He published "Eliyahu Zuṭa," a commentary on that part of Mordecai Jafe's "Lebush" relating to the Shulḥan 'Aruk, Oraḥ Ḥayyim (Prague, 1689, 1701). His valuable work "Eliyahu Rabbah" (Sulzbach, 1757), containing discussions on the Oraḥ Ḥayyim, was printed posthumously by his son, whose name is not given. "Shishah Shiṭṭot," novellæ on six Talmudic treatises, were published by his grandson Elijah b. Wolf Spira (Fürth, 1768). His manuscript works, including commentaries on the Bible and Talmud, as well as sermons, responsa, etc., were destroyed by fire in 1754. 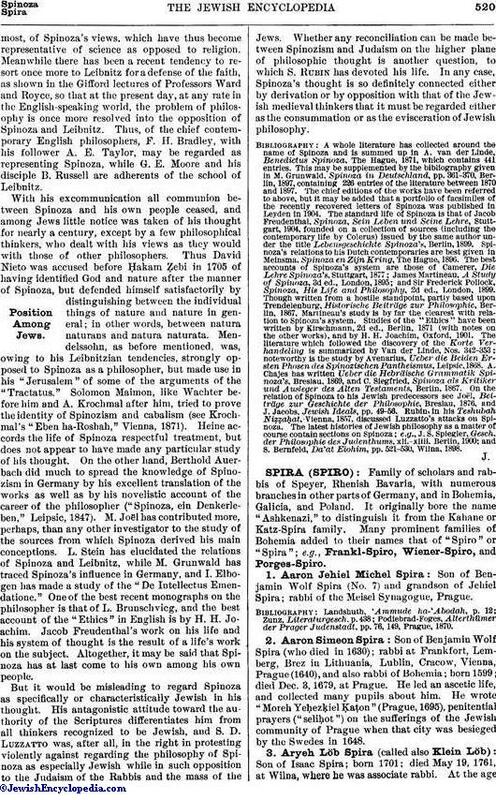 Son of Eliezer Spira; died March 16, 1711, at Lemberg. He wrote "Elef ha-Magen" (notes on the four ritual codices), printed by his son Nathan Spira (Zolkiev, 1732). Son of Jehiel Michael Spira; died at Prague in 1749. He was rabbi at Lissa, then at Jung-Bunzlau, Bohemia (1704-27), and finally at Prague, and was the teacher and father-in-law of Jonathan Eybeschütz. He wrote novellæ on Talmudic treatises, likewise responsa, etc. ; but none of his works has been printed. Son of David Kohen-Spira; died in 1582 at Cracow, where he had officiated as rabbi. He was the father-in-law of Rabbi Meïr Lublin. He had a namesake and contemporary, Isaac Kohen-Spira, who was probably rabbi at Kreminiec, and afterward at Cracow. J. B. R., Bemerkungen zu I. M. Zunz Ir ha-Zedek, p. 18, Brody, 1878. Rabbi and scholar of the sixteenth and seventeenth centuries; born at Grodno; died in Lublin 1623. He was principal of a large yeshibah at Kowlo, whence he went to Cracow and became identified there with the publication of his father's "Imre Shefer." While engaged upon this work he accepted a call as rabbi to Lublin, and the uncompleted work of his father's was taken to Venice, where it was published in 1583 under the title "Bi'urim." On account of the misrepresentations which were circulated in Venice re garding the contents of this work Isaac found himself compelled to forbid its further sale in that city; and in 1586 he issued a new edition in Lublin. Friedberg, Marganita Shappira, pp. 4-6. Polish merchant; born at Cracow 1624; died there 1649; son of Rabbi Nathan. 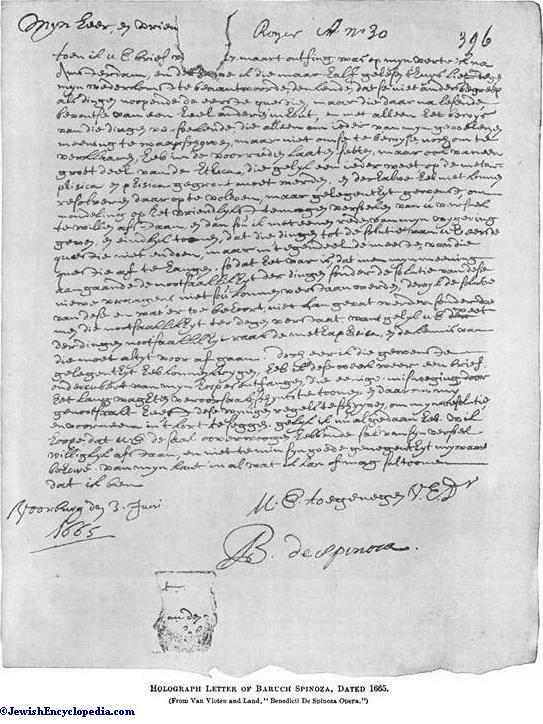 He was a man of means, and when, in May, 1641, the Jewish community of Cracow was financially embarrassed he voluntarily made it a loan of 800 Polish gulden in gold. When, toward the end of the eighteenth century, his tombstone began to decay, the community showed its gratitude by erecting a new one. Friedberg, Luḥot Zikkaron, pp. 61-62, Frankfort-on-the-Main, 1904. Son of Nathan Nata Spira (No. 23): died at Worms 1630. He was chairman of the rabbinical college at Pinsk, and later rabbi at Worms. He is mentioned in the responsa (No. 88) of MaHaRaM of Lublin, and in the responsa collection "Ḥuṭ ha-Shani," § 22. Scholar, rabbi, and preacher of the seventeenth century; died in 1700. While still young he was called to Kalisz in Poland, where he founded a large school which soon became famous. Among his most prominent pupils were Jehiel Michael Segal and Selig Margolioth. Israel was the author of "Bet Yisrael," a commentary on the "Hilkot Sheḥiṭah," of which 201 paragraphs appeared in Berlin in 1726. Appended thereto was a second work. "Bet Pereẓ," a commentary on the treatise Megillah which he wrote in honor of his son-in-law. Rabbi of Neutitschein, Moravia, in the seventeenth and eighteenth centuries; relative of Isaac ben David Spira. He was the author of "Ohel Ya'aḳob," haggadic novellæ (Frankfort - on - the - Oder, 1719). His sons Moses Moeschel and Isaac severally added to it "Liḳḳuṭim" to difficult passages in the Midrash and Yalḳuṭ and novellæ to Yoreh De'ah. Son of Isaac Spira; lived at Lemberg in the seventeenth century. He was the author of "Be'er Mayim Ḥayyim" (Cracow, 1616), a commentary on the Pentateuch and on Rashi's commentary. Rabbi of the seventeenth and eighteenth centuries; officiated probably in Frankfort-on-the-Main. He was the author of "Ha-Rekasim la-Biḳ'ah" (Altona, 1815), containing brief notes on the Bible. A native probably of Speyer. He wrote in 1430 "Ẓiyyuni" (Cremona, 1560), a cabalistic commentary on the Pentateuch, prefaced by a song for the Sabbath and enumerating the labors forbidden on that day. Cabalist and rabbi of Lublin in the seventeenth century; died in that city 1652; grandson of Nathan Spira of Grodno. He edited and published the Zohar (Lublin, 1623), to which he added a commentary. Son of Selig Spira and grandson of Nathan Nata Spira; died Nov. 13, 1761, at Eibenschütz. He was rabbi in various communities, his last charge being at Eibenschütz, in Moravia, where he officiated only one year, dying in early manhood. Dembitzer, Kelilat Yofe, i. 118 (contains Spira's epitaph, in which must be read instead of ). Son of Reuben David Spira, associate rabbi of Cracow; died at Reggio, Italy, in 1662. He was sent from Jerusalem to Germany and Italy to collect alms. Most of his works are cabalistic in nature, including "Tub ha-Areẓ" (Venice, 1655; Zolkiev, 1781), on the excellencies of the Holy Land, on the holy vessels, etc. ; "Yayin ha-Meshummar" (ib. 1660), on "Yayin Nesek"; "Maẓẓot Shimmurim" (ib. 1665), on the mezuzah, ẓiẓit, etc. Azulai saw the manuscripts of his religious discourses and of several of his cabalistic works. Steinschneider, Cat. Bodl. col. 2051. Zedner, Cat. Hebr. Books Brit. Mus. p. 609. Son of Solomon Spira and grandson of Nathan Nata Spira (No. 23); born about 1584; died July 20, 1633. In 1617 he was called to the rabbinate of Cracow, where, being well-to-do, he refused to accept a salary. He was gifted with an extraordinary memory, and devoted much time to the study of the Cabala. He wrote a cabalistic commentary on the prayer of Moses in Deut. iii. 24, and two prayers, under the title "Megalleh 'Amuḳḳot" (Cracow, 1637; Fürth, 1691). He published also novellæ to Alfasi's work which were printed with it (Amsterdam, 1720). I. M. Zunz, 'Ir ha-Ẓedeḳ, pp. 52, 176 (contains Spira's epitaph). Son of Nathan Nata Spira (No. 24); born in 1616; slain by the Cossacks under Chmielnicki in 1648. He was rabbi of Satanow, and edited, together with his brother Moses, the work "Megalleh 'Amuḳḳot," to which he wrote additions and a preface.